Today is Ashton's birthday. 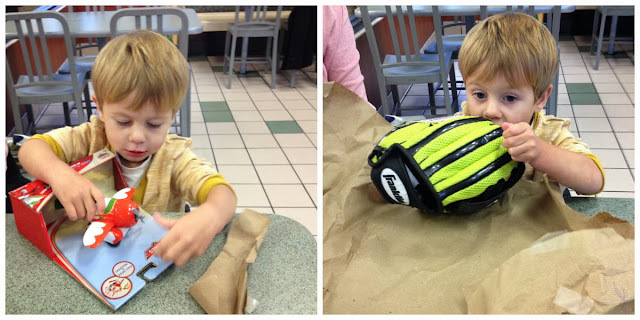 When Spencer turned two, it didn't seem as momentous as Ashton turning two. Maybe it's because this time my belly isn't round with another growing baby to replace him. I feel like Ashton should still be so far away from this milestone. Yet here we are. My baby is two. And there's little I can do about it, except embrace it and welcome the growth with open arms. As is our tradition, we celebrated each meal with birthday singing and candles. I love when their little mouths aren't able to produce enough breath to extinguish the candles, their lips rounded into a small O with barely a whisper of a breeze coming out. Big brother assisted Ashton when his attempts proved futile. While Spencer was at preschool, I hoarded some one on one time with the birthday boy and let him open a few gifts. The thrifted $1.50 pink princess grocery cart was a big hit. The rest were discarded and forgotten. Tonight we celebrated yet another birthday in the McDonald's play room with just our little family of four. We stuck a few candles in some ice cream, sang to the birthday boy and showered him with gifts. The airplane Spencer picked out all on his own was the favorite of the night. Ashton's big party is on Saturday, but there's something very special about our small celebrations on their actual birthday. Happy second birthday, Ashton John. Please steady your growing rate from now until your next big day. I've been doing interviews with Spencer on his birthday for a few years now. I wasn't sure if Ashton would be a willing participant this year, so I've been doing faux-interviews for weeks in preparation. Before I got a lot of "I don't knows" and "That's its" so I was pleasantly surprised to produce some real answers today. 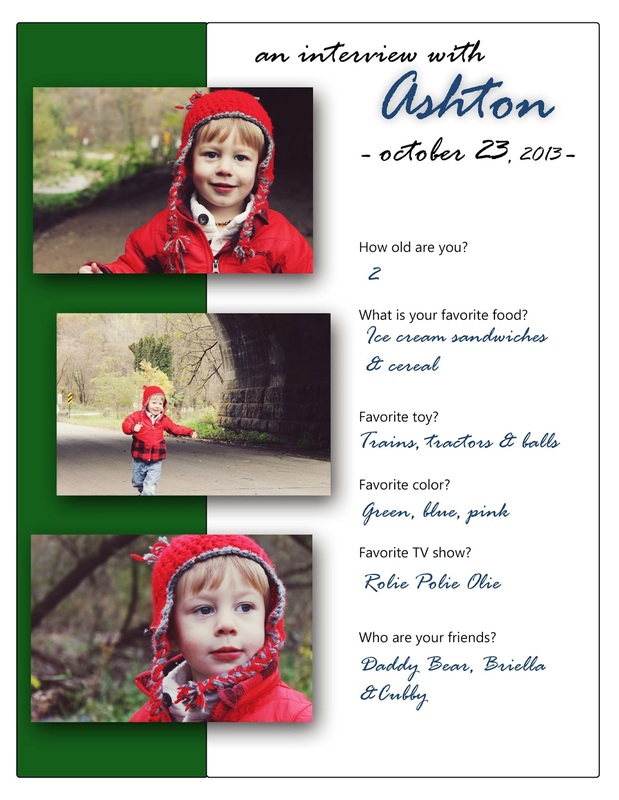 Here is Ashton's very first birthday interview. 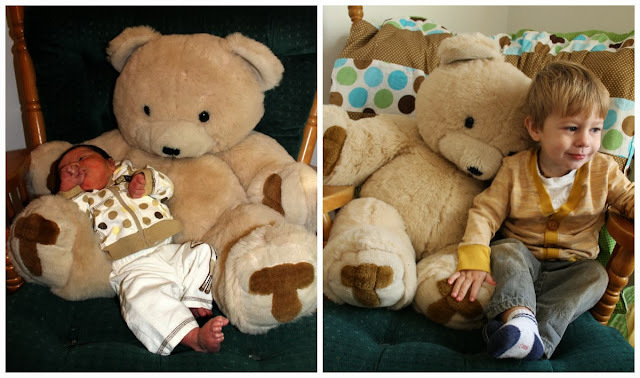 Ashton's last monthly growth picture with his beloved Daddy Bear. One day this week as Ashton and I were driving to get groceries, we passed a scenic park with arches under the train tracks. A photographer's ideal shooting location. The fall colors are fading fast and the temperatures are already winter-like. I made a spontaneous decision that we must record this season before it's gone and replaced with a white wonderland. And why not turn the opportunity into a mini shoot for my soon to be two-year-old, I thought. I turned the car around to retrieve my big girl camera and returned to this gorgeous backdrop to snap a handful of pictures. As we were there, a few teensy tiny white particles fluttered down on us and you could see traces of our breath steaming out of our mouths. 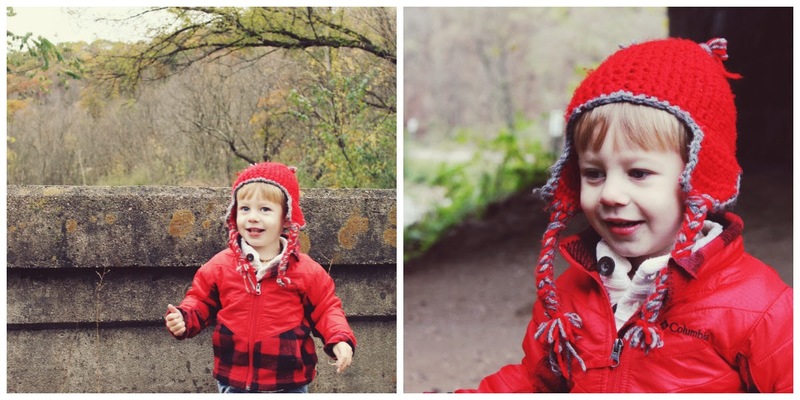 Enjoy my two year old boy encapsulated in this fall season. 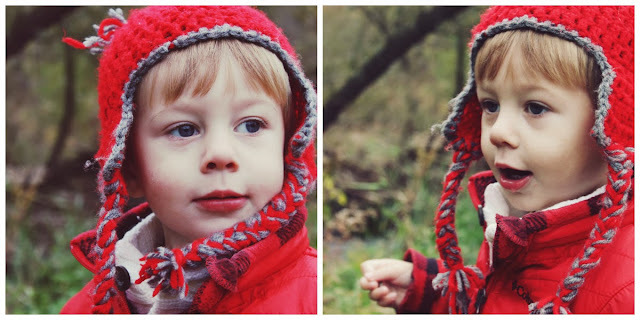 My Miracle Baby - the story of how we almost never met this little guy. Introducing Ashton John - the birth story. A Year Ago - revisiting my misdiagnosed miscarriage. 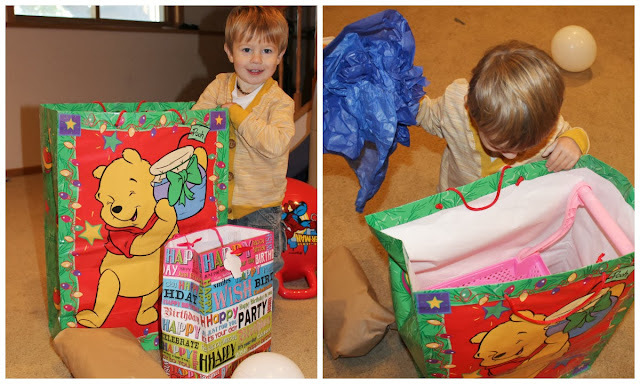 Ashton is One - his first birthday. Bye-bye Boobies; Hello 17 Months - a big milestone for the whole family.